I have been working on figuring out why Inbox by Gmail will not render my hero image correctly. There is space on either side if it is centered even though it should span the width of the email. It looks fine in all other clients (including Outlook). None of the coding I have tried is working (including completely redoing my template many times at this point...) and am banging my head against my desk. I would even be grateful for a program that allows me to look at the code in Inbox so I can troubleshoot it that way. NOTE: I have even tried putting the image in a <div> to get it to span 100% in the table. Try <img src="#" style="margin: 0; padding: 0; border: 0; display:block" border="0" width="<image width>" height="<image height>"> You may try to add width:100% to you image styles as well. Can you upload all the code for this email? <strong>Do you have a treasure find story to share?</strong> You could win our monthly contest by <a href="mailto:newsletters@kellycodetectors.com" style="color:#235ca1;display:inline-block;font-family: 'Trebuchet MS', Arial, Helvetica, sans-serif;font-size:11px; line-height:15px;font-weight:bold;text-align:center;text-decoration:underline;-webkit-text-size-adjust:none;" target="_blank" xt="SPEMAIL" name="EmailBUTTON">emailing us your story and pictures</a>. 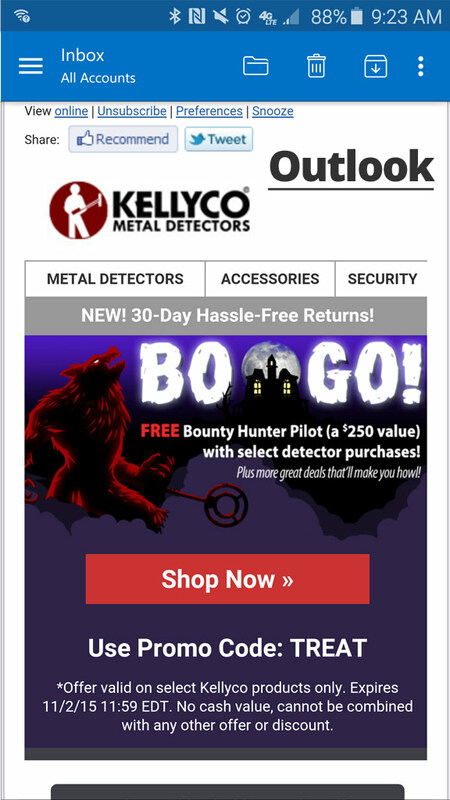 Read what other's have submitted on our <a target="_blank" href="http://www.kellycodetectors.com/treasure-stories/?utm_source=email&utm_medium=treasurestories&utm_content=treasurestories&utm_campaign=MSTRBOooGO20151026&utm_term=%%OptinSource%%" xt="SPCLICK" name="treasurestories" style="font-family: 'Trebuchet MS', Arial, Helvetica, sans-serif; font-size:11px; color:#235ca1; text-decoration:underline;">Treasure Finds &amp; Stories</a> page. 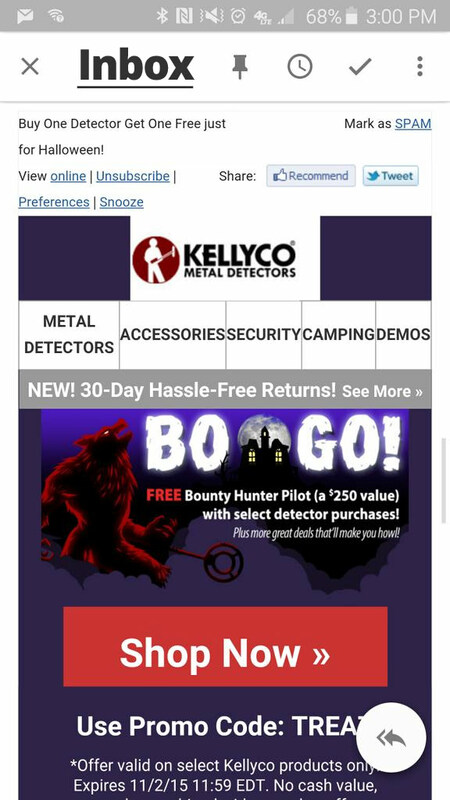 See <a target="_blank" href="http://www.kellycodetectors.com/catalog/terms-conditions?utm_source=email&utm_medium=TermsAndConditions&utm_content=TermsAndConditions&utm_campaign=MSTRBOooGO20151026&utm_term=%%OptinSource%%#story" xt="SPCLICK" name="TermsAndConditions" style="font-family: 'Trebuchet MS', Arial, Helvetica, sans-serif; font-size:11px; color:#235ca1; text-decoration:underline;">terms and conditions</a> for full details. I just tested this and I'm not seeing the issue. I would correct this however <img width="650px" to <img width="650"
I have isolated the problem to my Top Menu. I took it out and tested it again. The image is spanning the email again. Thank you for your help! For some reason Gmail didn't like the "navigation" at the top of my email being so big. I took out two of the links and now the hero is spanning the full width and is responsive.